I've got a list. It is filled with things I've started and need to finish. Finish bracelet with triangle beads. Instead of checking something off the list. I strung beads and crocheted a necklace. I found the perfect accent beads at the AKS Gem show last week. There is something about the heat and humidity that turn my attention span into that of nat! Stunning! 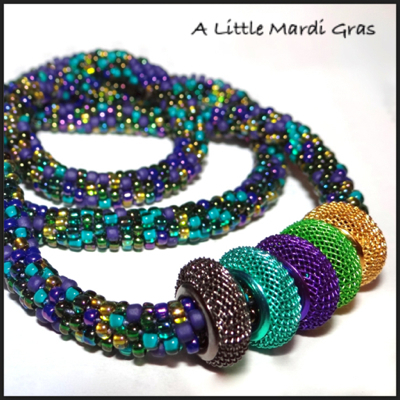 Love the colors and how perfectly the beads accent the rope. That's a gorgeous necklace! Thanks for having a short attention span! Marlene and Sue thanks for stopping by and the kind words! My short attention span also kept me from blogging. Kathy bead crochet is very for me is very relaxing. I can do it without thinking about the next stitch. Leaving my attention span to wonder about!